THE ONLY SUPER SOIL MIX ON THE MARKET TODAY THAT IS PREMIXED, AGED, AND READY FOR PLANTING IMMEDIATELY, WITH NO LAYERING OR ANY OTHER ADDITIVES NEEDED! DO NOT USE FOR SEEDLINGS, NEW PLANTS OR YOUNG CLONES. Mixasoil is a organic soil medium mix crafted from years of experience, trial, and error, and it is modified for excellent aroma, flavor, and harvest results. This is a high-quality, nutrient-rich super soil mix made with our own mix kits, with over 22 ingredients. The difference in our super soil is that we do all the work — the mixing, turning, and aging — until the soil is ready for planting. All you need to do is fill your planters, add plant, and water. Perhaps you don’t feel like doing the work or waiting all the time to age the medium, or you do not have the space to make your medium. This is the perfect product for you! Our super soil is an organic, living growing soil. It’s enriched with more nutrients, amendments, and trace elements than any other growing soil on the market today! Our premixed and aged super soil ready-mix mediums are completely prepared for planting, and growing. Unlike other super soils, with this organic soil no layering or any other ingredients are necessary. Just plant your three-week old plant in the soil, water, and watch the results! A great feature about this organic soil is that after the growing season is over you can use the medium over and over and over, as much as you’d like. Just remove the stem and roots, then re-amend with a Mixasoil Re-Amend Kit and add 3 pounds of worm castings ,or buy our Mixasoil Re-Amend Kit that includes worm castings. Then just mix and water, turning occasionally for two to four weeks, and you’re ready to grow again. Mixasoil Soil Mix Kits include all of the nutrients, trace elements, and amendments necessary for a full season of growing. No other nutrients or amendments are needed during growing life cycle. Just add water with a PH of 6 to 6.5. Let tap water set overnight for chlorine dissipation. Over Twice the Nutrients of Other Competitors Without the Nutrient Burn!!! A tip for growing new seeds and seedlings in Mixasoil Super Soils. Take your 5 Gallon Planter and fill with Super Soil mixture. Leave enough space at the top of the planter for a 1-gallon planter. Place the 1-gallon planter in the top of the 5-gallon planter. Fill the space around the 1-gallon planter with the Super Soil and fill to the top. Slightly pack the soil around the top of the 5-gallon planter. After you remove the 1-gallon planter, what you have is a space to put a plant with root ball or fill with a seed starter soil mixture. Plant new seeds or a seedling. Therefore creating a temporary grow space for a new seed or seedling to grow. No need for transplantation and the exact amount of time needed before your plant reaches the Super Soil! Makes 1.5 cubic foot or 2-5 gallon planters of mix. Start with 5 gallons Sphagnum Moss. 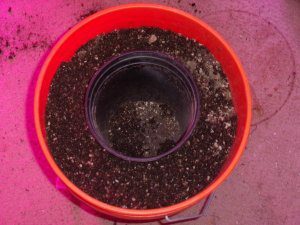 Add 4 to 5 gallons of perlite, the Mixasoil Mix Kit, and 3 pounds of worm castings. Moisten the soil but do not soak. Turn the soil every couple days for at least one month before using with plants. Our super soil cycles high nitrogen with medium phosphates and potassium for early growth. Close to the same for mid-growth vegetation. Finally, less nitrogen and more phosphorus and potassium for the flowering phase. Dry molasses provides amino acids, carbohydrates, sucanates and micro-organisms. Correct use of nutrients is important essentially for two reasons, the first, plain and simple. Marijuana plants are unique and different from your average vegetables or houseplants. I’ve noticed that so many growers out there use generic feeding regimens. with nutrient combinations of nitrogen (N), phosphorus (P), potassium (K), and micronutrients were exactly the same as simple houseplants. In doing so, they are not giving their crops the ingredients necessary to thrive. This sets them up for a poor harvest from the get-go. Assuming that all plants are the same in growing and require the same type of nutrients at the same stages of growth is certainly a horrible mistake. What I have noticed even worse is that amateur growers compound this major mistake. Assuming that any old N-P-K micronutrient fertilizer will be sufficient for their crop. Let’s face it, the sad truth is that an alarmingly number of nutrient makers would rather just slap on some snazzy packaging. This makes you feel good about what you are buying. Assuming that the generic “soup” you’ve bought will do the work for you. The second big reason why nutrients are so important to your plants. Growth lies in not selling yourself short as a grower. Examine what you are doing. Investing in expensive seeds all the while putting in all the time. Properly set up the lights, CO2 and environmental controls. The super soil medium, a water source, installing power input hardware. Building the grow room to give yourself the best growing habitat. In essence growing the healthiest of plants with the highest yielding buds possible. Anything less, and you are really selling yourself short. Nutrients and the skillful mastery of their use are your tools. Ensuring that you don’t sell yourself short. I have put together these kits and super soils to grow the VERY BEST products.